Most of the wreckage of the helicopter is under water. Emergency and coastguard teams were sent to Loch Scadavay in North Uist at 10.15am after the AS350 squirrel aircraft plunged into the water. The aircraft, which had just one person on board, was transporting containers in connection with a nearby fish farm. The spokesman said their “priority” is to document and preserve physical evidence – from the aircraft and details such as ground marks and fuel samples – and speak to witnesses. The wreckage will usually then be recovered and taken to a facility in Farnborough. Police and other emergency services were sent to the scene – several miles from the nearest road – yesterday after the alarm was raised at 10.15am. Coastguard teams from Stornoway, Benbecula, Tarbert, Scalpay, Griminish and Lochboisdale were sent to the scene, alongside a search and rescue helicopter based in Stornoway. An ambulance spokesman said they received a call at about 10.20am and sent two ambulances and a team leader. A fire service spokesman said they were called to assist the ambulance service just after 10.25am. Jerry Francis, chief executive of PDG Aviation Services, confirmed that the incident involved an AS350 squirrel aircraft. 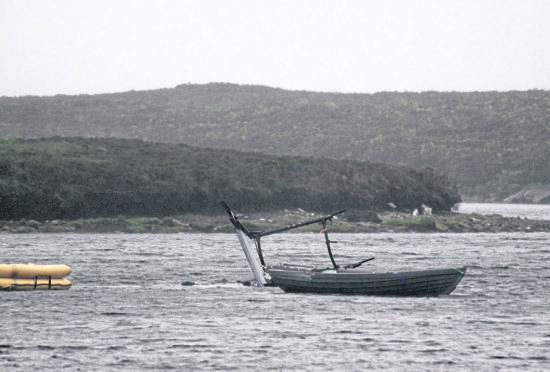 It is believed the helicopter was operating on behalf of Edinburgh-based Scottish Salmon Company, who have a number of sites in the Outer Hebrides, including at Langass which has a major hatchery and is near Loch Scadavay. The A867 was closed yesterday between Lochmaddy and Clachan na Luib until mid afternoon, with a diversion in place via the A865. Loganair flights to and from Benbecula Airport were also disrupted by the incident. Western Isles MSP Alasdair Allan and Highlands and Islands MSP Donald Cameron also voiced their concerns about the incident on social media yesterday.